Record and Play Video in the same Digital Device! * Video play & display, 2.2± QVGA stereo TFT LCD or VGA binocular stereo display module, play & display 2D/3D video file in AVI form. This camera is standard definition and suitable for web use. * Squeezed side by side format. Perfect for 3D output in Youtube. Simply tag the output "yt3d:enable=true" when uploading the video to Youtube. Your viewers will be able to choose side-by-side, anaglyph or a multitude of other formats. No pre-editing required like many other 3D cameras. 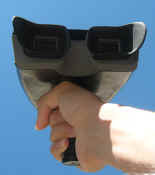 * Binocular lenses allow viewing in 3D without glare from the sun in outdoor shooting. 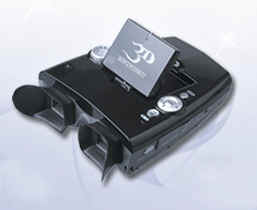 * 3D static image capture in JPG at VGA degree. Movie/Video Capture: real-time MPEG-4 encoding( 3D/2D), stereo mp3 encode and discoed. Image Capture: JPEG encode/discoed(3D), 2D image up to 3mega pixels. Memory Support: maximum 8GB capacity of SD/MMC card. Monitor: Auto stereoscopic 2.2 inch stereo Barrier stereo display LCD no glasses needed! Audio And Video Interface: A/V output intercalation interface. Power: built-in power supply: +3.7V 1800mAh, working around two hours continuously. External Power: +5V DC power adapter.